Release Date: October 27th, 2006 by Focus Features. The Cast: Tim Robbins, Derek Luke, Bonnie Henna, Mncedisi Shabangu, Tumisho K. Masha, Sithembiso Khumalo, Terry Pheto, Michelle Burgers, Mpho Lovinga, Mxo. BASIC PREMISE: In 1980 South Africa, Colonel Nic Vos (Robbins) detains Patrick Chamusso, a potential terrorist. Based on a true story. 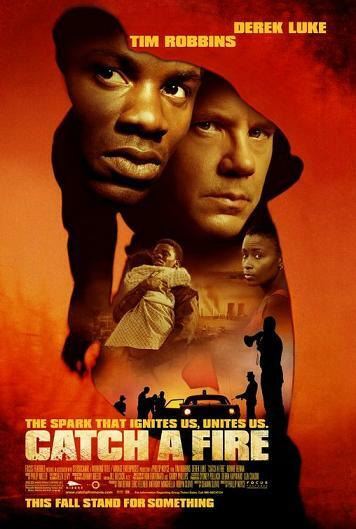 ENTERTAINMENT VALUE: Catch a Fire could have been much more suspenseful with a tighter script. During the apartheid in South Africa, Colonel Nic Vos, an anti-terrorist colonel, hunts down Patrick Chamusso and arrests him. Patrick claims he’s not responsible for the recent bombings and has a believable alibi: he was coaching a soccer game for little kids and having an affair with Miriam (Pheto). Upon release, his wife (Henna) gets arrested as well and he becomes involved in terrorist activities for the ANC, the African National Congress. Unfortunately, his transformation into an ANC activist happens too quickly and, therefore, seems contrived. The second act meanders too much without enough suspense and the cat-and-mouse chase in the third act feels underwhelming. Nonetheless, Tim Robbins and Derek Luke give convincing performances and director Phillip Noyce adds a fast pace as well as stylish cinematography which help to make this a mildly entertaining film. It's not nearly as powerful and suspenseful as Tim Robbin's domestic anti-terrorist film, Arlington Road. INSULT TO YOUR INTELLIGENCE: Not enough suspense, occasionally contrived and meandering. IN A NUTSHELL: Decent performances and stylish cinematography barely compensate for an occasionally contrived, meandering plot that lacks suspense.